As the Senate fails to muster votes and the president says ‘let Obamacare fail,’ Maine’s senators and about a dozen governors call for a bipartisan fix for the health care system. WASHINGTON – As divisions between the party’s two main ideological camps widened Tuesday, Republicans were scrambling to contain the political fallout from the collapse of a months-long effort to rewrite former President Barack Obama’s signature domestic accomplishment. President Trump predicted Tuesday that Republicans would wait for the federal insurance market to collapse and then work to broker a deal to rewrite the nation’s landmark health-care law, while Senate leaders pressed ahead with a plan to repeal the Affordable Care Act without an immediate replacement. But it quickly became apparent that Republican leaders, who were caught off guard by defections of their members Monday night, lacked the votes to abolish parts of the 2010 law outright. Three centrist Republican senators – Susan Collins of Maine, Shelley Moore Capito of West Virginia and Lisa Murkowski of Alaska – said they would oppose any vote to proceed with an immediate repeal of the law. “I did not come to Washington to hurt people,” Capito said on Twitter. Collins said that she had urged Senate Health, Education, Labor and Pensions Committee Chairman Lamar Alexander, R-Tennessee, to hold hearings in an attempt to fashion a legislative fix for the ACA, while leaving it in effect in the meantime. 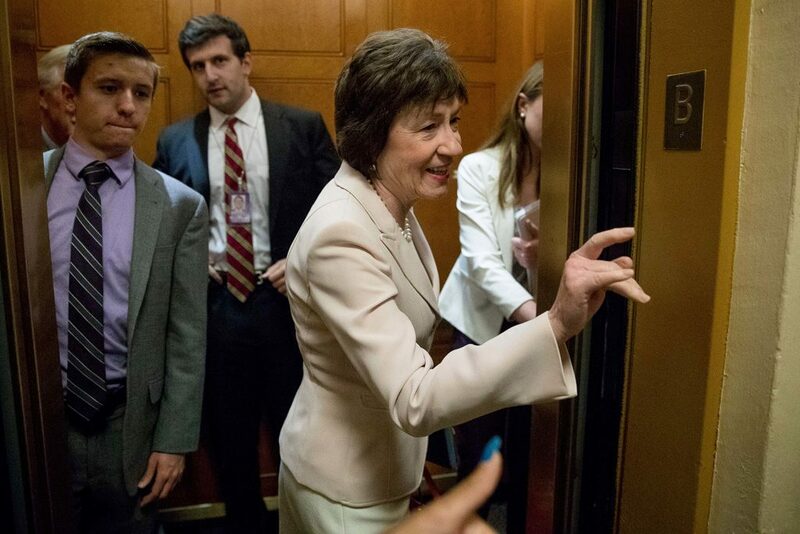 “I do not think that it’s going to be constructive to repeal a law that at this point is so interwoven within our health care system and then hope that over the next two years we will come up with some kind of replacement,” Collins said in a statement Tuesday morning. “I think that would create great anxiety for individuals who rely on the ACA. Maine independent Angus King was among a handful of senators who were joined by 11 Republican and Democratic governors in calling on congressional leaders to launch a bipartisan process to revamp the nation’s health care system. “The events of the last couple of days around here with regard to health care have given us a real opportunity to do something together on a bipartisan basis – to improve the present health care delivery system in this country,” he said in a statement. He suggested starting with lowering the cost of prescription drugs to make health care more affordable. “What I hope we can do is put aside the ideology, put aside ‘you know, we got to check a box on repealing or replacing,’ and let’s talk about how we can work together to improve the health care system, make it more accessible, and more cost effective – or another way to say that is – less expensive for the American people,” he said. Sen. Ron Johnson, R-Wisconsin, said Tuesday that lawmakers need to get a more detailed analysis of what has caused consumers’ premiums to rise and what could make insurance more affordable. Speaking to reporters in the Roosevelt Room on Tuesday afternoon, Trump said he was “disappointed” in the demise of the Senate bill and viewed the cratering of the nation’s individual insurance market as the best way to advance his goals. Trump’s latest comments intensified the political uncertainty on Capitol Hill, where Republican leaders were debating what to do next, and they raised anxiety among insurers that must commit to staying on the federal health exchange within a matter of weeks. Republicans are reeling after two more Republican senators declared their opposition Monday to the party’s plan to overhaul the nation’s health care system, likely ending their quest to make good on a Republican promise that has defined the party for nearly a decade and has been one of Trump’s top priorities. In many ways, the leadership plan did not go far enough for those on the right, but was too radical for Republican centrists. It scaled back some key ACA requirements and made deep cuts over time in Medicaid, but preserved popular provisions of the law such as a ban on denying coverage to consumers with costly medical conditions. Sen. Orrin Hatch, R-Utah, said he was “very concerned” by the overall situation and he offered a blunt assessment of why Senate Republicans fell short on their bill. “We are so evenly divided and we’ve got to have every Republican to make things work and we didn’t have every Republican,” he said. Senate Majority Leader Mitch McConnell, R-Kentucky, showed no signs of abandoning his push for a single-party solution, opening the Senate on Tuesday morning touting his latest plan – to vote on a pure repeal, with a two-year delay, by taking up the House’s health-care bill. But in a sign of the extent to which Senate leaders have lost control of the process, Senate Majority Whip John Cornyn, R-Texas – whose job is to count votes – said he had “no idea” that Sen. Mike Lee, R-Utah, was joining Sen. Jerry Moran, R-Kansas, in defecting Monday night. Cornyn learned about it that night “a little after 8 o’clock,” he said, after he and six other Republican senators dined with Trump at the White House. As Republicans tried to regroup, Senate Minority Leader Charles E. Schumer, D-New York, renewed his calls for the majority to work with Democrats to shore up the health insurance system. “Now that their one-party effort has largely failed, we hope they will change their tune,” he said, noting that some Republicans have been calling for bipartisan talks. Schumer quoted Sen. John McCain, R-Arizona, who said Monday night that “Congress must return to regular order” and rewrite the health-care legislation with input from both parties. The Senate leader also acknowledged that his party has suffered a political setback. The confusion over next steps highlights the predicament now faced by Republicans, who have made rallying cries against Obama’s 2010 health-care law a pillar of the party’s identity. They may be forced to grapple with the law’s shift from a perennial Republican target to an accepted, even popular, provider of services and funding in many states, which could make further repeal revivals difficult.